JE Dougherty described himself as outdoor photographic expert. However, he also appears to have done indoor photography. Below is I a postcard of one of his JE Dougherty's indoor portraits, believed to have been taken in 1919. This is the only portrait by JE Dougherty that I have seen. Phil Wilson provided details of the people in this portrait. They are his grandfather William Fisher Wilson and his siblings. The name was spelt Dougharty in the trade directory but Dougherty on the ink stamp on the back of the postcard, so I have assumed that the latter is correct. 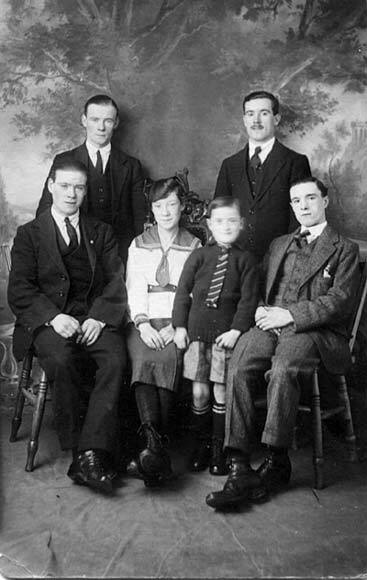 Thank you to Phil Wilson for sending me details of the postcard above - a photograph of his grandfather and five siblings before all except James emigrated to Canada in 1919.